Eli Manning’s Future as a Giant: I’ve been a big supporter of Eli Manning throughout his career and especially most recently over the past three seasons. I believe too much blame was thrown on his shoulders early in the season behind a horrendous offensive line. 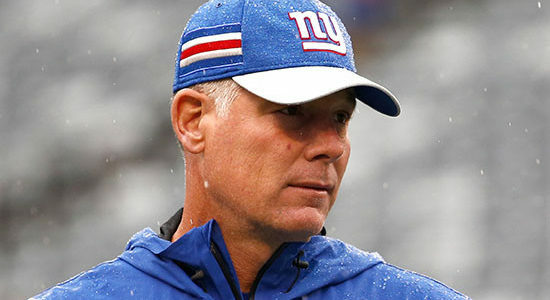 Head Coach Pat Shurmur has already hinted that Eli Manning will be back for 2019 as the starting quarterback. However; GM Dave Gettlemen was very non-committal when discussing Manning in his last press conference to the media. So there are mixed signals on what the Giants plans are for Eli Manning in 2019. If the Giants release Manning by the March deadline; it would save the Giants $17.5 million towards the cap, however; by retaining him for at least 2019 it could be an indication on what they might do in the draft; especially in the 1st round regarding their quarterback of the future. The Giants do need to find Manning’s successor and if they truly have doubts about Kyle Lauletta, then they could address it in this year’s draft. Oregon quarterback Justin Herbert has already declared that he will return to Oregon, so scratch his name off the list. Many mock drafts have the Giants selecting Haskins with their first pick (6th overall), however; I am in the minority to believe that Gettleman will not reach for a quarterback with only one year of experience under his belt and pass on the wealth of talent; especially on the defensive side of the ball that could impact the Giants defensively in 2019 like Saquon Barkley did offensively this season. Verdict: Despite Gettleman’s non-committal comments, the Giants will restructure Manning’s contract with a one year extension until 2020; which will give them additional cap space and they will look on Day 2 for a quarterback to replace Manning. Trades: The Giants should look to see if there’s interest in a few of their marketable players such as: Janoris Jenkins, Kareem Martin, Alec Ogletree, Olivier Vernon and even Odell Beckham Jr. If the Giants can find suitable trading partners for these players; which could bring back quality picks and/or players in return, they must make this moves after June 1st; which would give them the most cap relieve and minimize their dead money as well. This would give them an additional $58.1 million towards the cap. Other possible trade candidates, but highly unlikely could also be Sterling Shepard and/or Evan Engram as well. Verdict: Gettleman will make a trade or two involving any of the names mentioned above after June 1st for future draft picks or for a player/player’s currently on an NFL roster. Cap Casualties: Players like Rhett Ellison, Connor Barham and Jonathan Stewart could also be prime examples of a salary cut; which would net the Giants another $8.5 million. Gettleman is not shy when it comes to wheeling and dealing and clearing cap space and if he does trade/cut the above players after June 1st, the Giants could have approximately $98 million in cap space and only roughly $16 million in dead money. These moves may not benefit the Giants in the 2019 draft, but it will help towards future drafts with the additional draft picks. Verdict: Gettleman will release and/or trade all of the names mentioned above. Replacements can be found through free agency, the draft and the waiver wire at a fraction of the cost. Free Agency: This one works hand and hand with clearing out cap space and finding the right pieces that would make this team more competitive. I’ve been a great believer that a championship team is built from the inside out. Which translate to building and improving both sides of the trenches? The offensive line is a mess and that should be a top priority, but let’s not forget the other side and the lack of a top edge rusher and a run stuffer (since the departure of Damon Harrison). The early returns on Nate Solder haven’t been what the Giants expected, although he did improve in the second half of the season by allowing only one sack. If the Giants decide to move on from; Solder, their only option would be to trade him after June 1st as his dead money would only be $4 million and they would save $13 million towards the cap. Unless Gettleman is going to totally start over with the offensive line, I expect the Giants to retain Solder for at unless one more year. Will Hernandez is a lock at left guard and Jamon Brown should be re-signed at right guard (at the right price). However; the other two spots (center and right tackle) should be a priority to fill in the off season via free agency and/or in the draft. Verdict: Look for Gettleman to target RT Daryl Williams of the Carolina Panthers, RT Ja’Wuan James of the Miami Dolphins and/or OC Matt Paradis of the Denver Broncos this off season in free agency. The Draft: This will be the bread and butter part of the plan that will ensure a brighter future for the Giants. Last season, GM Dave Gettleman had a solid draft and needs to match or top it in 2019. Thus far, the Giants have nine picks and that total could increase with compensation picks of possibly 11. Any trades in the off season by Gettleman for draft picks should happen after June 1st and would go towards future drafts starting in 2020. Verdict: Gettleman will continue to add more picks towards future drafts and package a few in trades for either a player currently on an NFL roster or trading up in the draft. Final Thoughts: GM Dave Gettleman has gone on record that the Giants will not trade Odell Beckham by saying “we didn’t sign him to trade him”. In the NFL, player’s need to be under contract to be eligible for trade considerations, so trading Beckham isn’t a reach and utilizing his salary towards other positions of need would be more beneficial to the Giants overall as they could fill multiple spots to improve the team with the additional cap space. Landon Collins was not mentioned as a possible trade candidate and although there is a possibility that could occur, I believe the Giants will use the franchise tag on him. Currently; this team has no identity and that needs to change in 2019. Despite today’s game being more of a passing league, the Giants need to get back to their roots and construct an offensive team centered on running back Saquon Barkley, despite the talents of Odell Beckham. This is not an omission of abandoning the passing game, but providing a more balance offensive attack that opposing defenses must honor and one that would make the Giants more productive should be the plan. On the defensive side, the Giants need to regain that swagger they once had during their Super Bowl years and it starts with a dominant defensive line that can stuff the run and put pressure on the quarterback. The formula for success is a simple concept; run the ball effectively and stop the run effectively. GM Dave Gettleman was part of the Giants regime during the Giants first two Super Bowl victories and if there’s anyone qualified to bring the Giants back to their glory days and finding the right pieces, it’s Gettleman.